We welcome hearing from all of our past clients so we can continue to improve the Elmhurst experience! Choosing to have our wedding at Elmhurst was one of the best decisions ever! Kaleigh, Laura and all the staff at Elmhurst we’re extremely accommodating and eager to help! From start to finish our entire experience was nothing short of amazing! Luckily the weather held up and we got to have our ceremony in the beautiful outdoor space which was absolutely perfect. I’ve heard many compliments over the last few days about how delicious the food was and how large the portions were! It was definitely just as good as our tasting in the spring was. Although I didn’t get the chance to enjoy the nacho bar, I also heard it was nothing short of amazing. If I had to do my wedding over again, I would have it at Elmhurst every single time! From start to finish, our experience with Elmhurst was great. The ceremony site, reception hall, food, staff, and just overall treatment from everyone there was top notch. All of our questions were answered promptly and professionally as we worked towards the actual event. They accommodated all of our needs and requests and were very happy to do so. When it came to setting things up the day before and the actual day of, it seemed as if there were always 2 or 3 staff members around that were ready to respond to our every question and every need. Overall, the staff there were exceptional. The food exceeded expectations. We were provided with a tasting dinner several months prior to try out some of the options where we sat down with the coordinator and went over many of the logistics. The food at the tasting was amazing. We were sceptical that they would be able to recreate our tasting food on such a large scale on the day of our wedding, but sure enough, they came through. There wasn’t one issue with our food. It was hot, delicious, and exactly what we had asked for. 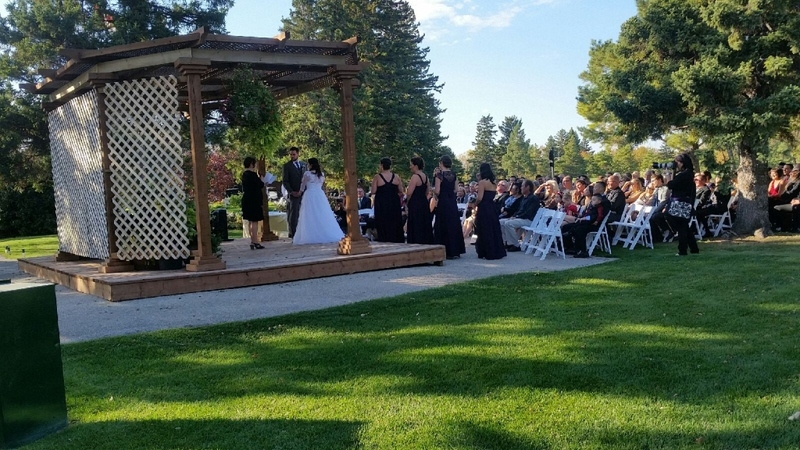 They also have a nice ceremony site about 100 yards away from the reception area. It was very convenient to have everything in one location. Overall, we are very glad that we chose Elmhurst to host our wedding and would highly recommend it to anyone.